Have an idea for a feature? The feedback forums are now online so you can post your ideas today - and of course you can always send a tweet to us on @twiDAQ. We have added a new feature to twiDAQ to help you discover and invest in new stocks. Now you can stay up to date on the latest trends and topics and make informed decisions on how to build up your portfolio! 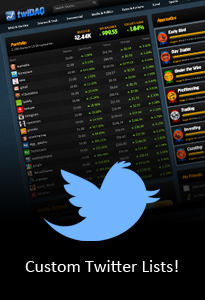 We've created an easy way for you to keep up to date with the stocks in your portfolio! 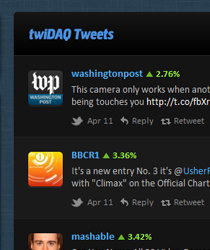 You can now get your own Twitter list for your stocks on twiDAQ and have it automatically update each time that you trade. This means you don't need to follow each of your stocks to see what they're talking about and find out when to cash in!